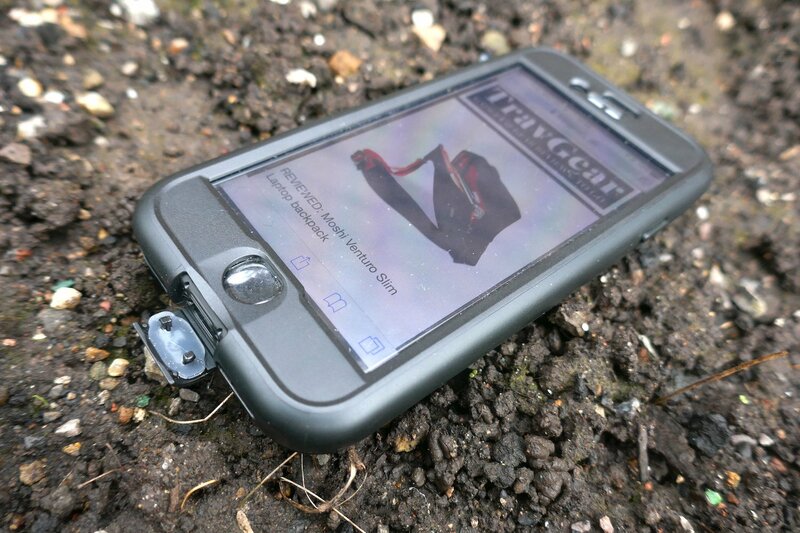 When it comes to phone cases to be used outdoors, it’s all about trust. Is it waterproof? I mean, is it really waterproof, as in, can I take it canoeing, sailing, or just go swimming and dunk it in a river? The same goes for drop-proof claims. Happily, the new Tech 21 EvoAqua 360 Edition ticks all those boxes, and yet it’s not a particularly pleasant case to take into the great outdoors. The Tech 21 EvoAqua 360 Edition is sturdy. Really sturdy. It’s specs are impressive; when wrapped around an iPhone 7 and you can drop it from from 2 m/6.6 feet, and take it underwater to 3 m/9.9 feet (that latter spec depends on pressure). So it should do the trick for most outdoors trips. The Tech 21 EvoAqua 360 Edition is also one of the few so-called waterproof/drop-proof cases that doesn’t bottle it at the last minute and leave crucial parts of the phone uncovered. No, across the front is a tough plastic screen, but also covers for the front camera, microphones, flash, and the rear cameras. Cut-outs around buttons and the Apple Lightning slot are well covered in doors that slam shut. It even covers the all-important Home button on the iPhone, albeit it in a softer, more pliable clear plastic. That latter concession to usability doesn’t work very well. Yes, you can press your thumb into the Home button and use your phone, but it’s rather hit and miss, and an action that must be repeated a few times. We also quickly realised that the plastic screen prevented finger slides up from the bottom, meaning it was hard to turn off Wi-Fi, increase the brightness, and operate the flash as a torchlight, etc. The cover on the camera also means that it’s impossible to take good photographs while the Tech 21 EvoAqua 360 Edition is in place. It’s always the way; these complaints are more things to remember about using all waterproof phone cases – we’ve tested loads and they all have these faults. However, not only does the Tech 21 EvoAqua 360 Edition fail to address them, but it’s also really, really hard to get on and off. Seeing as this is only ever going to be an occasional case for a phone, it means a bit of irritating phone admin before and after outdoor activities. The integrated two-piece design is actually very handy in terms of understanding what to do (some waterproof phone cases are extremely complicated and come with at ;east three layers), but once the phone is in the case there are a total of 17 clips to snap into place. This takes time, and in our test activity of white water rafting I wasn’t quite sure when it was 100% leakproof. At the end of the outdoor activity, getting the case off the phone was a pain; you need fingernails of steel to get the first few of those clips de-attached. However, once you’ve done that, it’s easy enough to rip off the rest of the case. And, yes, the phone was bone dry! So, really, we shouldn’t complain – this case does what it says it will do.